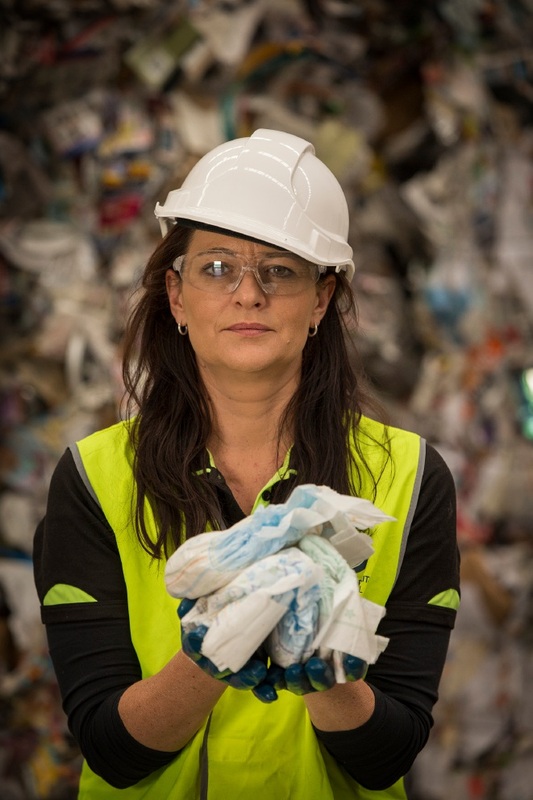 A recent nappy audit carried out by the South Metropolitan Regional Council (SMRC) found that more than 200 used nappies were delivered to its Materials Recovery Facility (MRF) every day. The MRF processes the contents of the yellow-topped recyclables bin, where nappies are often mistakenly disposed. A spokeswoman for the SMRC said nappies contaminate recycling streams like paper and cardboard, resulting in export bans for entire containers at a considerable cost to both the council and the community. “Some containers of paper have been stopped from entering overseas recycling destinations as a result of nappies ending up in them,” the spokeswoman said. She said the incorrect disposal of nappies – which should be placed in the green-topped bin – also damaged more than just the budget. “Nappies in the recycling bin are a biohazard and we feel we have a responsibility not to send biohazards to other countries, even if their standards for importing, particularly of waste, may not be as high as in Australia. “When nappies incorrectly go into the yellow-topped bin, they end up in landfill and produce methane, which is 24 times more potent than carbon dioxide and contributes to global warming. “The takeaway message is that nappies should always be placed in the green-topped bin. “There are also alternatives to disposable nappies in using cloth.